Chester porphyria does not conform to any of the recognized types of acute porphyria (see image below). This schematic diagram of biochemical abnormality shows the sites of enzymatic defects of the various porphyrias on the left side of the diagram and the dual enzyme abnormality of Chester porphyria (deficiency of porphobilinogen deaminase [PBGD] and protoporphyrinogen oxidase) on the right. ALA = delta-aminolevulinate; COPRO = copro-porphyrin; HMB = hydroxymethylbilane; HMB-S = hydroxymethylbilane synthase; PROTO = protoporphyrin; URO = uroporphyrin. The urine porphyrin excretory pattern varies from the pattern of acute intermittent porphyria to variegate porphyria. Chester porphyria exhibits reduction in enzymatic activity of both porphobilinogen deaminase (an enzyme with reduced activity in acute intermittent porphyria) and protoporphyrinogen oxidase (an enzyme with reduced activity in variegate porphyria). Chester porphyria manifests with attacks of neurovisceral dysfunction common to all acute porphyrias. Unlike in variegate porphyrias, cutaneous photosensitivity is not a feature of Chester porphyria. The frequency of Chester porphyria is low, and it is only described in the city of Chester, England. Poblete-Gutiérrez P, Wiederholt T, Martinez-Mir A, et al. Demystification of Chester porphyria: a nonsense mutation in the porphobilinogen deaminase gene. Physiol Res. 2006. 55 suppl 2:S137-44. [Medline]. [Full Text]. Crimlisk H. Dobson's complaint: the story of the Chester porphyria. BMJ. 1999 Jan 30. 318(7179):336A. [Medline]. [Full Text]. Youngs GR, ed. Dobson's Complaint: The Story of the Chester Porphyria. London, England: The Royal College of Physicians of London; 1998. McColl KE, Thompson GG, Moore MR, et al. 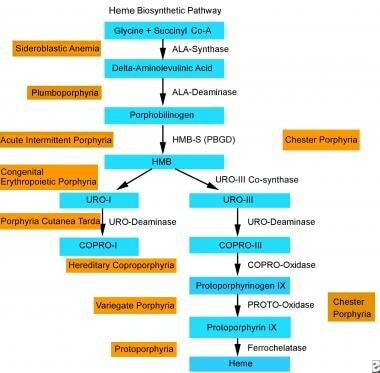 Chester porphyria: biochemical studies of a new form of acute porphyria. Lancet. 1985 Oct 12. 2(8459):796-9. [Medline]. Qadiri MR, Church SE, McColl KE, Moore MR, Youngs GR. Chester porphyria: a clinical study of a new form of acute porphyria. Br Med J (Clin Res Ed). 1986 Feb 15. 292(6518):455-9. [Medline]. [Full Text]. Norton B, Lanyon WG, Moore MR, et al. Evidence for involvement of a second genetic locus on chromosome 11q in porphyrin metabolism. Hum Genet. 1993 Jul. 91(6):576-8. [Medline]. Pischik E, Kazakov V, Kauppinen R. Is screening for urinary porphobilinogen useful among patients with acute polyneuropathy or encephalopathy?. J Neurol. 2008 Jul. 255(7):974-9. [Medline]. Billoo AG, Lone SW. A family with acute intermittent porphyria. J Coll Physicians Surg Pak. 2008 May. 18(5):316-8. [Medline]. Church SE. The Chester porphyria. MD thesis, University of Liverpool, United Kingdom. 1986. Sardh E, Rejkjaer L, Andersson DE, Harper P. Safety, pharmacokinetics and pharmacodynamics of recombinant human porphobilinogen deaminase in healthy subjects and asymptomatic carriers of the acute intermittent porphyria gene who have increased porphyrin precursor excretion. Clin Pharmacokinet. 2007. 46(4):335-49. [Medline].